Fall is upon us! Love the cooler but yet comfortable weather. Perfect for walking in the woods which is my favorite thing to do (next to playing with fabric of course). The acorns are really abundant this year so I started acting like a squirrel and collected a bunch. I used my easy easy landscape pattern moon over the mountains to make a little art quilt. I then painted a 9" by 12" stretched canvas with a reddish maroon, let it dry and added a gold tannish color. Then got out the old glue gun and glued my acorns and a few other goodies picked up in the woods. Hint: with acorns the caps usually fall off when they dry so glue the caps onto the body of the acorn first. I printed out the word reflection on a tan paper then used modge podge to put on the canvas. 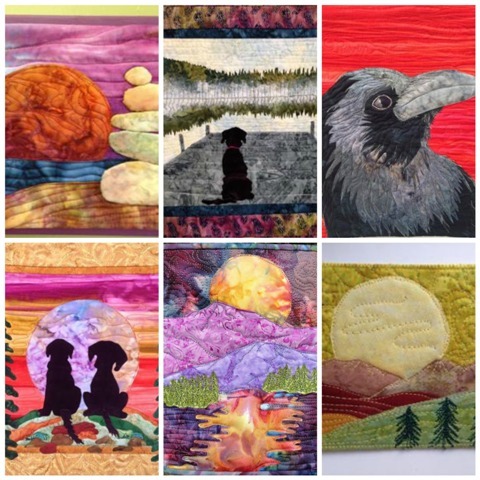 This idea of using the stretched canvas brings these small art quilts to a whole new level. To attach the quilt to the canvas I'm still experimenting. I've tried heavy duty Velcro which worked great but it can get expensive if you make a few of these. This one, since I had the glue gun out anyway I used that and it seems to hold fine. I read somewhere that someone sewed it on by hand. I think I'll try the next one that way and see how it goes. Have you ever mounted an art quilt on stretched canvas? September 21-27 is banned books week where book lovers celebrate the freedom to read whatever book we want to read. Go here to read about the quilt challenge involving banned books. "Never look over your left shoulder at The new moon"
The book I picked was written in 1885 and is considered a classic. I had never read it so got it on audio to listen to. It's available free on Libravox. I enjoyed listening to it because you get the "southern dialect" of that time. Now beware, this also includes a lot of the "N word" but back in those days this was just what African Americans were called. I didn't find it distracting to the story at all. I did enjoy seeing a friendship form between a white boy and a slave. The commradery of the two main characters is the most important part of this book. Thus the two sitting on the raft together looking at the moon. Times were so different and this book gives you a glimpse into what it may have been like in the south back in the late 1800's. Back to the quilt - this was my basic design. I then quilted words from the book that I thought were ....... Well just cool words. Into the sky and river. So I blended some blue and white fabric paint together and used my fancy blending shading applicator (an old sock) and highlighted some of the words to look like part of a reflection from the moon. It's soft and subtle but does help you see the words. Granted my text quilting skills are not great but it came out pretty good I think. I learned when quilting text without marking, give yourself a lot of room because you will need more room than you think. I ran over the side more than once and had to pick it out. Yes, I could have marked it but then would feel the need to stay perfectly in those lines and what fun is that? I'm having some issues here though - his little beak is showing the under part so he is looking up and the face just doesn't look right. I think I have the eyes to high. I like the snow on the branches but wanted ice. So last night I tried my glue gun. This is a branch sample I am using, good thing because my glue gun had a wood glue stick in it and those are yellow. Looks like toxic ice! But I could see where it might work with the clear glue. You can see in the second photo where this morning I took my mini glue gun which already had a regular glue stick and tried the ice. Not bad but I think a bigger blob of glue would be better. And less snow. Maybe try doing the ice first then dab on alittle snow. I will finish this, it's only 8"x10" but will take what I learned and try another making the adjustments. Anyone have any suggestions on the face? Or the ice? I would love any input or ideas you have. Update - I couldn't take looking at that poor broken beak any longer so I hacked off a chunk of already fused fabric and stuck in down. Yes, better. And used my big glue gun with a clear glue stick - voila! Ice! This week I needed a break from art quit making and am free motion quilting with abandon. My mother has been quilting for 60 years so you can imagine the stash she has accumulated . This spring she went thru a bunch of UFO's and came across these cute little flower blocks half done. I told her if she pieced them, I would quilt it. I've been watching both Leah day and Angela Walters on craftsy so am practicing some of their "moves"
But after a few blocks I eased into this - no eyelashes! Leah Day says that most of the time when you get eye lashing it's because your speed is not consistent which makes sense because my meandering is small and I was not consistent with speed because I felt awkward with it. Practice, practice, practice. Throwing in some coneflowers here and there. Except for someone chewed the finger off my beloved machinger gloves this morning. I think she wants me to stop this crazy quilting business and take her out for a walk. I highly recommend taking a craftsy class - they are wonderful! But wait until they go on sale, they have half off sales quite often and you can get a class for 20 to 25 bucks. Totally worth it.